Microgrid finance for behind-the-meter projects has been primarily a bespoke, one-off affair involving a single asset. Dynamic Energy Networks (DEN), backed by The Carlyle Group, aims to change that. The Boston, Mass.-based company has assembled what it believes are the critical elements needed to streamline, accelerate and expand microgrids on an enterprise scale. That includes a technology partnership with Schneider Electric. Finding strategic capital partners, with the ability to mobilize significant financial resources, has been the most challenging aspect of microgrid development. The Carlyle Group, one of the world’s largest private equity groups, has made an initial commitment of $500 million in DEN to invest in modernizing energy infrastructure through microgrids and distributed energy resources (DER). DEN aims to deliver resilient, reliable, and sustainable energy at scale to serve large businesses, government facilities, institutional campuses, and connect them to the surrounding communities. Join us May 7-9 at Microgrid 2018 where DEN, The Carlyle Group, and Schneider Electric will discuss how to grow microgrid markets by reducing customer risk. Microgrid Knowledge spoke with Steve Pullins, DEN’s vice president of development, for insight into DEN’s approach to catalyzing the microgrid and DER market to scale. The market for microgrid finance and project development is “disjointed,” Pullins said. Some in the industry are trying to apply standard project development and finance models that are likely not efficient. “Project finance specialists are used to structuring utility-scale assets, a wind farm or solar array, for instance. But when you get into microgrids you’re dealing with multiple asset classes — distributed renewable generation, CHP [combined heat and power], energy storage, etc.,” he said. 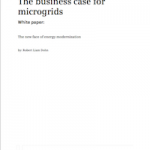 Pullins said he has seen instances where financing of multi-asset microgrids was undertaken by structuring the project based on the characteristics of its individual components rather than as connected network. DEN describes itself as taking a holistic, integrated approach, which differentiates it from others. The company delivers energy as a service, and by doing so eliminates risk for the customer in a shift from a capex to an opex model. DEN founder and CEO, Karen Morgan, formerly served as president & CEO of RET Capital, where she built an ownership platform of over 200 MW of renewable operating assets and over 220 MW of solar development assets. Pullins and his team have designed over 60 microgrids and deployed the first utility and community based microgrids in the United States. Morgan said that DEN’s strength in the market is predicated on its best-in-class partner model and a management team with decades of experience in innovative capital structuring and domain expertise. The combination enables DEN to deliver a holistic, industrial strength, integrated model to build, own and operate microgrids and DER at scale, she said. Track news about microgrid finance. Subscribe to the free Microgrid Knowledge newsletter.